Your body can throw all kinds of kinks in an ultra. During your preparation for your race, consider everything that could go wrong while you are out there. Think about all the body functioning issues you or your friends have had during training or races. You need to think of things that have been issues in the past as well because things have a way of revisiting you at the worst times. 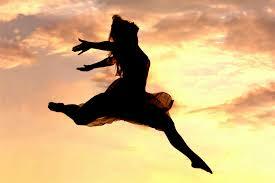 Even things that have never been a problem for you in the past, but have for your friends can spring up. Some experienced ultra-runners go out with minimal gear, not me. I have it all because it allows me to focus on the race and not worry about the what ifs or the oh shits. Preparation is about expecting the unexpected. You’re already dealing with a lot when you are out on the course—managing your mood swings, food, hydration, and pain management. Dealing with something unexpected without the proper solution only adds to your load. Blisters—have tape, band-aids, alcohol, mole skin, Neosporin and other such things. All of this can be used for cuts and scrapes if you fall as well. Diarrhea—have anti-diarrhea medication or preventative measures. If you don’t like medication while running a table spoon of apple cider vinegar in 6-8 oz of water can help. I’ve also heard Turmeric can help as well. Have extra shorts and undies available. Carry wet wipes with you. Indigestion, nausea, and vomitting—have ginger in some form: chews, crystalized, or ale. Peppermint is another one you can use. There are of course medications as well. Keep in mind stomach issues can be caused by electrolytes being out of balance which is an easy fix. Just ingest more electrolytes and wait (don’t stop moving). Your stomach cannot absorb water without electrolytes, which means both water and food just sit there and make you uncomfortable. Another, more extreme/distasteful, solution is to make yourself vomit and start over. Heat exhaustion/stroke and sunburns—keep your skin covered and sun block on. Ziploc bags of ice under your hat, in your sports bra, and shoved down sleeves will help you stay cool. Ice rolled up in a bandana around your neck is a good option. Dunk your hat and shirt in rivers or ice water. Move side to side along the trail to remain in the shade when possible. Hydrate and watch your electrolytes. You may have to slow your pace. The faster you run the higher you drive your body temperature. Add temperatures of 90-100 degrees and it could be a very dangerous situation. Hypothermia—Make sure you have what you need to stay warm and don’t assume you can’t get hypothermia when the temperatures aren’t “that low.” Hypothermia happens when your body temperature drops too low. If you are running in temperatures close to 100 during the day and then temperatures drop to low 50s or 60s at night, you could get into trouble. Keep extra clothes on hand so you can add layers and change wet clothes. If your base layer gets wet from sweat, you should change clothes before the temperatures drop at night. Sore knotted muscles—this is just par for the course, but there are some things you can do about it or at least try. Massage relieves things for short time, which can get you moving again. Your crew can use their hands or a massage tool like the stick. You can pack along a foam roller in your crew vehicle too. Tiger balm and icy hot can be helpful. I never recommend medication. There have been studies done that say it’s not helpful. If it is helpful, masking pain can prevent you from feeling a serious injury that could lay you up for months if you continue to run on it. Plus, it can cause stomach upset and worse heart rate increases, blood pressure changes, and kidney damage. Twisted ankle or knee—braces and athletic and/or kensio tape. Over the years I’ve collected various braces for knees and ankles. I put these in my crew vehicle, just in case. If you catch an old/new injury early enough a brace may get you through the race without causing major damage to the tissues requiring tons of time off. This is always a balance between finishing and harm. Your crew and pacers should know what symptoms to watch for with these ailments and how to treat various things. There is a chart with this information on my Ultra Crew page above. For lists of items I carry in my medical and blister kits, see my page on gear lists above. Temperatures are climbing here in the western United States and that means coping with the heat and preventing heat stroke and heat exhaustion. Heat stroke is a serious condition, which can damage and kill brain cells by causing the body’s temperature to rise to a core temperature of 105 degrees Fahrenheit. It can also cause death. Symptoms of heat stroke include dizziness, throbbing headache, red hot and dry skin, no sweating, muscle cramps, nausea and vomiting, rapid heartbeat, shallow breathing, confusion, disorientation or staggering, seizures, and unconsciousness. If you suspect someone has heat stroke, you must cool them down as quickly as possible. You can do this by getting them out of the sun, putting ice on their neck, armpits, and groin area, fanning them with water while wetting their skin. Heat related illness is related to the heat index, which is how hot you feel when the effects of the air temperature and humidity are combined. Higher humidity makes you feel hotter because it hinders your body’s ability to cool itself through sweating. Also being in full sun can increase the heat index by 15 degrees. 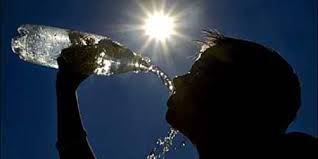 Some people are more prone to heat stroke than others, such as, people over the age of sixty-five and under four, athletes, people with a chronic disease, someone who is dehydrated or consuming alcohol, sleep deprivation, and people on particular medications (check with your doctor to see if your medication lowers heat tolerance). Everyone is different when it comes to heat sensitivity. A sudden change in temperature without adequate time for the body to acclimatize increases the risk for heat related illness. There is not a certain temperature when heat related illness becomes a possibility, but the more factors that are present the more aware you need to be to look for symptoms. 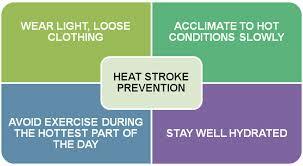 To reduce your risk of getting heat stroke or heat exhaustion wear loose fitting light colored clothing, wear a light weight hat with a large brim or that also covers your neck, wear sun screen (sun burn increases the risk of heat stroke), hydrate, and take electrolytes. For those of us who will be running in the heat you can increase your heat tolerance by running in the heat. Make sure and take the above precautions before you go out to heat train. Take water with you on your run, start small with three miles, and then increase a little bit at a time. If you start to get show signs, seek some shade and try again another day. If you do get heat stroke, you are more prone to getting it again at least for the next few months because of the damage to your cooling system and because whatever caused you to get it in the first place is likely still present.